By bringing the Nineties back to the Sixties, General CV’s software provides a layer of control over the synthesizer that allows adventurous users to create sounds stretching far beyond the familiar — cheesy, even — tones of General MIDI with which they may already be familiar. From making the synth behave like a VCO (Voltage Controlled Oscillator) to creating complex chords and textures — even to abusing drum sounds into pitched sources, General CV brings rich pickings of fresh flavours to Euroack’s à la carte modular menu. But jesting apart, General CV has a number of modes of operation, including: behaving like a modular VCO, but using a massively multitimbral and polyphonic synthesizer engine as its tone source; automatically creating chords and arpeggios from a pitch CV; playing MIDI files from an MicroSD (Secure Digital) card, including special support for playing loops synchronised to a clock pulse; and acting as a drum machine with up to nine independent drum trigger inputs. Each mode also benefits from internal four-band EQ, as well as stereo chorus and reverb effects. Connectivity comes courtesy of nine inputs and two outputs — all on 3.5mm mono (TS) jack sockets. The outputs are labelled L and R, respectively, and are simply the stereo audio outputs from the General MIDI synthesizer with a maximum output level of around ±8V (16V peak-to-peak). X- and Y-labelled inputs are digital, typically used for gates or clocks — simple on/off signals (with an expected voltage range of 0 to +5V); inputs 1, 2, and 3 are analogue, 10-bit unipolar CV connections (with an expected voltage range of 0 to +5V); inputs 4 through 7 are high-resolution analogue, 14-bit bipolar CV connections (with an expected voltage range of -5V to +5V) — all are protected from damage due to voltages outside the recommended range (so long as they remain within the Eurorack standard ±12V). Five front panel-positioned rotary encoders also serve as push buttons, enabling easy access to various functions dependent on the current mode of operation, but, generally speaking, set to work as follows: A (navigate the system); B (turn to adjust parameter; push to advance to next parameter page; push in, hold, and turn to scroll through parameter pages); C (turn to adjust parameter; push to return to first parameter page); D (turn to adjust parameter; push to display mode-specific information); E (turn to adjust parameter; push to show input key). 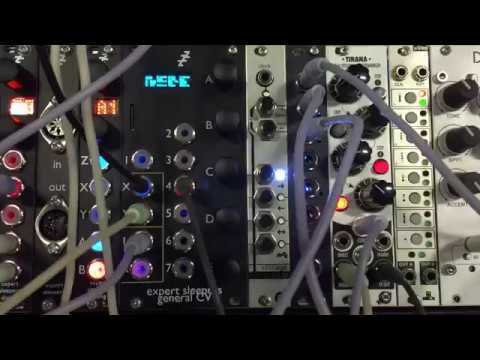 Guiding General CV creativity still further, the ‘General MIDI’ module follows in the footsteps of Expert Sleepers’ similarly-distinctive disting mk4 — the latest (fourth) improved iteration of its award-winning ‘many-in-one’ multifunction Eurorack module successfully showcased at The NAMM Show 2017 in Anaheim, California — by also including the company’s eye-catching red and blue backlit sockets… surely sealing the deal for anyone wishing to take the 1991-vintage General MIDI standardised specification for electronic musical instruments that respond to MIDI messages kicking and screaming into today’s wonderful world of Eurorack with creative CV control possibilities that are out of this modular world!